Susan Atkins is terminally ill; Charles "Tex" Watson is an ordained minister. 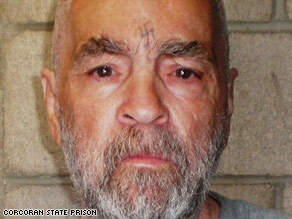 They and other members of Charles Manson’s murderous "family" now shun him. The Manson family members were initially sentenced to death, only to have their sentences commuted to life in prison when the U.S. Supreme Court struck down death penalty laws in 1972, establishing a four-year moratorium on executions. By her own admission, Atkins held Tate down as she pleaded for mercy, and stabbed the eight-months-pregnant woman 16 times. In a 1993 parole board hearing, Atkins said Tate “asked me to let her baby live … I told her I didn’t have any mercy on her.” After stabbing Tate to death, according to historical accounts of the murders, Atkins scrawled the word “pig” in blood on the door of the home Tate shared with her husband, director Roman Polanski, who was not home at the time. Three of Tate’s house guests were also slain, as was a teenager who was visiting the home’s caretaker in his cottage out back. Atkins’ compassionate release was opposed by Tate’s sister, Debra, Los Angeles County prosecutors and California Gov. Arnold Schwarzenegger, among others. However, the former prosecutor who won her conviction, Vincent Bugliosi, said he supported Atkins’ request for release. Debra Tate told CNN in an e-mail she does not believe any Manson family member convicted of murder should ever be set free. She said the slayings of the victims, including some that may have not been discovered, were “so vicious, so inhumane, so depraved, that there is no turning back. ” “The ‘Manson Family’ murderers are sociopaths, and from that, they can never be rehabilitated,” Debra Tate said. “They should all stay right where they are — in prison — until they die. There will never be true justice for my sister Sharon and the other victims of the ‘Manson Family.’ Keeping the murderers in prison is the least we, as a society who values justice, can do.” In a manuscript posted on her Web site, Atkins, who was known within the Manson family as Sadie Mae Glutz, wrote, “I will never be able to replace what my crime took away. And that’s not ‘neat,’ and that’s not ‘cool. '” Known as Katie within the Manson Family, Krenwinkel killed coffee heiress Abigail Folger at the Tate home and, the following night, stabbed Rosemary LaBianca and carved the word “War” on her husband Leno LaBianca’s abdomen. She remained faithful to Manson throughout her trial and into the first few years of her incarceration, according to a profile posted on the University of Missouri-Kansas City School of Law Web site, but she later “made strides to turn her life around.” Now 61, Krenwinkel is a model inmate at the California Institution for Women in Frontera, according to Lt. Robert Patterson, a prison spokesman. She is involved in the Prison Pups program, which helps train puppies to be service dogs, he said. “It gives you a reason to wake up every morning, and keep moving on,” Krenwinkel told Los Angeles station KABC, a CNN affiiate. The program at that time had trained more than 100 dogs; Krenwinkel said she was training her seventh dog. According to the Manson Family Today Web site, which keeps tabs on all things related to the case, Krenwinkel has largely accepted the fact that she probably will never leave prison. Her next parole hearing will be sometime before December, Patterson said. Van Houten was convicted in the raid at the LaBianca home, where she helped hold Rosemary LaBianca down as the woman was stabbed to death. At the time, she was 19. “The autopsy reports have shown that it was Tex that wielded the fatal wounds, but I contributed, and I attempted to hold her down for Pat [Krenwinkel],” Van Houten said in a 2002 appearance on CNN’s “Larry King Live.” “I called to Tex because we couldn’t kill her. You know, it’s — morally, I feel as though I did.” Her conviction was overturned in 1976, on the grounds that a judge erred in not granting a mistrial after the disappearance of her attorney, Ronald Hughes, who later was found dead. In Van Houten’s first retrial, the jury was unable to reach a verdict, and she was released on bond for a few months. But in her third trial, in 1978, she was convicted of first-degree murder. Known as Lulu within the Manson family, Van Houten, a former high school homecoming queen, is serving her life sentence at the California Institution for Women at Frontera, the same facility as Krenwinkel and, until last year, Atkins. Like Krenwinkel, Van Houten is involved in prison programs and is a mentor to other inmates in the facility’s college program, Patterson said. She is also a model inmate, he added. During her 2002 CNN appearance, Van Houten called Manson “an opportunist of the cruelest, most vicious kind.” But she was quick to emphasize that she accepts blame for her role in the crime. Like the others, Van Houten, 59, has repeatedly been turned down for parole. She is widely seen as the best candidate for parole. But her next parole hearing probably will not be until 2010, according to Patterson. “Tex” Watson’s participation in the Manson murders is “a part of history that he deeply regrets,” according to a Web site dedicated to his prisoner outreach program. Watson converted to Christianity in 1975, several years after he was incarcerated, and became an ordained minister in 1983, according to the site. “He was manipulative,” Watson said of Manson in a November 2004 radio interview, the transcript of which is posted on the Web site. “But I take full responsibility for my ignorance, lack of identity, emptiness and choices in life, which left me prey to his deceptive plan. My actions were my own.” Watson stabbed four people, including Tate, to death and fatally shot two others. After the Tate murders, Watson reportedly told Manson, “Boy, it sure was helter skelter.” However, Watson was not tried along with the others in the slayings. A month and a half after the two-night crime spree, he said, he fled to Texas. Watson, now 63, writes on the site that he has no computer or Internet access in prison, but maintains contact with the site administrator through the mail and writes much of the site’s content. Watson had been denied parole 13 times as of November 2006, a correction spokeswoman said. His next parole hearing is scheduled for November.